CDs, MP3s, downloads... pah! It's all just stuff 'n' nonsense, isn't it? If you're so cool that your coolness has doubled back and given you a taste for all things "retro", then we have just the music player for you. If you're afraid all those lovely vinyl disks you scoured the charity shops for are gathering dust, give them a spin on this. We test the Groov-e Retro Series Vinyl Record Player. 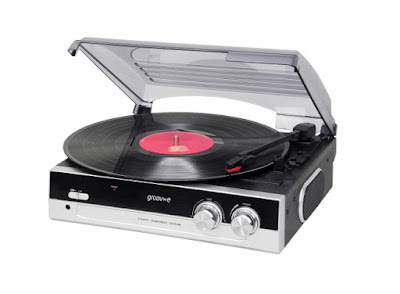 Yep, Groov-e still make a record player. In fact, they've only just started to make them; such is the demand for old-school music players. We've previously reviewed their range of cassette and CD players, but their quest to satisfy the needs of all musical fans stretches even further back in time. And before you go thinking that this must therefore be a high-tech product of the 21st century, with the ability to search YouTube while the disk is spinning, it is not. The technology used in the Groov-e Retro Series Vinyl Record Player is basically the same as that which you would have found in one from the 1970s (although without the wear and tear of forty years of use!). Capable of playing all sizes of vinyl disks (even with the lid down) the player has some classically retro styling without a shred of modernising features. The volume and tone controls are nice big and chunky knobs on the front, and there is a choice of 33 or 45 rpm. It has an auto stop function to stop that endless crackle and fizz once the disk is finished, and also a built-in speaker, again just like the classic machines of old. And it really does sound like an older machine. 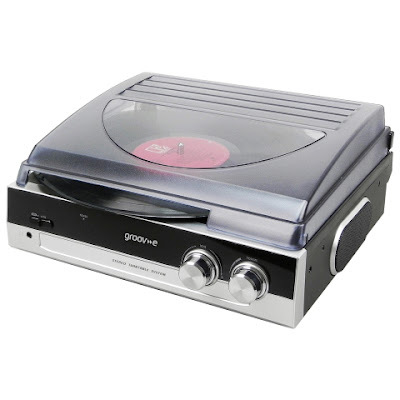 Although the speaker is clean and crisp, it isn't very powerful, making the Groov-e Retro Series Vinyl Record Player suitable only for close-to listening and nothing more than single room use. But it does feature RCA line-out sockets, and a standard 3.5mm headphone port, so you could hook up external speakers if you so wished. But no Bluetooth. We know, right. Outrage! Tee hee. Be it for yourself or for a friend who looks down their nose at digital music, the Groov-e Retro Series Vinyl Record Player nicely hearkens back to a simpler musical time and actually reignited our love of that distinctly vinyl sound.